Emma used to be engaged, but her fiancé disappeared after he made it clear he didn't want to marry her. Emma thought John passed away, rumors were going around that he died in combat. However, he's very much alive and is back in London four years later to choose a bride. When John meets Emma he immediately sees the benefits of their situation. They've never officially ended their engagement and he would be more than happy if she wouldn't set him free like she planned. He needs a wife he can trust to make his sister's introduction into society as easy as possible and he feels Emma is the ideal candidate. Does she have the same idea? Emma likes living in her own cottage and values her freedom. She doesn't mind giving up a little luxury if it means she can lead the life she wants. John is now a Duke and most women would do anything to marry him, but Emma isn't one of them. John has to find a way to convince her that breaking off their engagement would be a bad idea. He needs Emma for his sister, but if he's completely honest with himself he's impressed by her fierce personality and regal beauty. Will she give him a second chance? The Reunion is a wonderful romantic story that made me smile from beginning to end. Emma is a strong woman. She's smart, resilient, fierce and outspoken. She can stand up for herself and knows what she wants. She's exactly the kind of woman John is looking for, but he hasn't treated her well and needs to persuade her that marrying him would be the right decision. This leads to plenty of interesting conversations and each of them is equally fascinating and entertaining. John and Emma are evenly matched when it comes to intelligence and boldness and this makes fabulous reading. The sparks are flying off the pages. Sara Portman has managed to perfectly capture the time she's writing about. I loved reading about the gorgeous dresses, the rules of society and the intrigues of the ton. Her writing style is captivating and vibrant, which makes her story a joy to read. The Reunion is filled with unexpected twists and turns, amazing chemistry and complex family relationships. I really enjoyed reading this gorgeous heartwarming story and highly recommend it. If you love regency romance The Reunion is an absolute must-read. 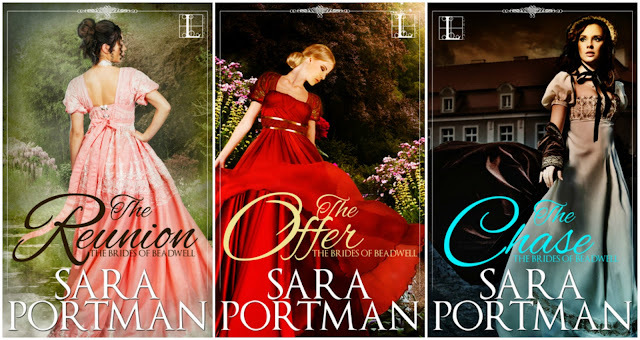 Sara Portman is an award-winning author of historical and contemporary romance. Her debut novel, THE REUNION, was named the 2015 winner in the Historical Category of the Romance Writers of America® Golden Heart® contest. When not reading or dreaming up romantic fiction, Sara works in corporate finance by day and holds a B.B.A. in Accounting. As part of her academic experience, Sara spent a semester in London, UK through a study abroad program at Richmond College in London. Her anglophile tendencies continue today. Absolutely! I am both a writer and an accountant. By day, I work in corporate finance for a media and communications company. I have an accounting degree, but did spend one wonderful semester in college studying abroad in London. It remains one of the greatest experiences of my life. I have always lived in the Midwest, but I love to travel. I also love to spend time with my big, blended family who have been incredibly supportive of my writing career. I am an unorganized, introverted procrastinator who is constantly in search of the magical version of a day planner that will solve all my self-discipline problems! 2) Can you describe the main characters of The Reunion in seven words each? Oh, I love this question! Here are my thoughts, but I’d love to know which words readers would choose! 3) How did you get the idea about the never broken engagement between Emmaline and John? I love friction-y romances in which the hero and heroine begin as each other’s antagonists because their purposes are at odds. So, of course, when I sat down to pen my first historical romance, I wanted to start from there. I wanted to start with a ballroom gossip scene and someone from her past, but in order for them to be at odds, they couldn’t both want to break the engagement. The very first scene I wrote in this book is the one in which Emma’s arguments to end their relationship are what actually convince him that she’s the one. 4) How do you handle the research for your stories and what’s the most fun part of this process? Like everyone, I do a lot of research on the internet, but despite the wealth of information on the web, I find I still need research books that delve more deeply into the places and people I want to understand. I have a growing collection of antique books that include memoirs of women from the time, collections of prints of important locations, and a guide to British manor houses, complete with fold-out family trees. 5) What do you like the most about regency romance? I think what I like best boils down to women being unconventional. There were so many restrictions and societal expectations and a lot of the great regency romances are about women finding ways to flout these conventions. They are really stories of empowerment. 6) If you could spend a day in the time you’re writing about what would you do? I would research, of course! I would love to shadow real people in the regency era to understand the little details of daily life that are still foggy to modern writers and readers. 7) You combine work in finance with writing. What’s that like? I think working in finance and writing fiction is my personal yin and yang. Accounting is by no means an outlet for creativity (that sort of accounting is generally called ‘fraud’) and writing never has to follow a set of rules. In that way they are both very different. They are similar, however, in that they tend to both be solitary activities, so I guess that means I am an introvert, through and through! 8) How was it to win the Romance Writers of America Golden Heart Contest? In one word. . .
. . . nevermind! There isn’t one word that can describe the feeling! I was exhilarated and grateful and overwhelmed. Winning the Golden Heart made me feel like I was my own version of Cinderella at the ball. After the awards ceremony, I was getting onto the elevator with Stephanie Laurens and Victoria Alexander and I said something in the manner of gushing about how wonderful they are, and Stephanie said to me, “Oh honey, you’re one of us now.” I don’t think she could have said anything else that would have made me feel as wonderful as that did. 9) You write romance, what does real love mean to you? I love reading and writing romance, but what I know of real love is that the end of these stories is really just the beginning of all the hard work and continual growth that is part of a lasting relationship. My first marriage ended after eleven years. I am now a wife and mother in a large blended family. Real love means we let go of defining family based on blood lines or presenting the perfect image. We are messy and flawed and took a circuitous route to end up together but we are absolutely dedicated to each other and our family, and we wouldn’t have it any other way. This spring, I’m headed to the RT Booklovers convention, and I’m thrilled to say The Reunion is a Reviewer’s Choice Award Nominee! I am currently working on a new series for Lyrical Press called the Merchant Royals that will release in 2019. It follows the rising class of merchant princes in and around Liverpool during the industrial revolution. Those who have read my Brides of Beadwell series may recognize the heroine of the first Merchant Royals book, as she made a cameo appearance in The Chase. 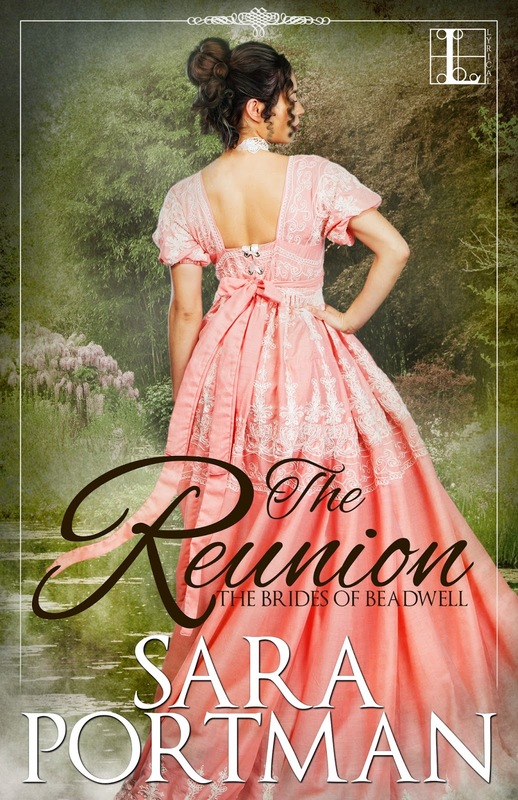 Three very lucky readers of With Love for Books will receive digital copies of the complete Brides of Beadwell series containing: The Reunion, The Offer and The Chase by Sara Portman. Congrats on the series! These sound amazing :) thanks for the fun spotlight and interview! These covers are so pretty!Great to read all about the author, thank you. The Reunion sounds like a wonderful, character driven historical romance that will hook you from the first page. Aren't they though?! The credit for the covers goes to Nathalie Gray. I'm so glad you like them! Thanks so much to Suze and Anniek for having me on your blog. Good luck to everyone in the giveaway! I can't wait to read The Reunion! Hi Sara, your books look lovely. Very romantic. Thanks for coming on here to talk to us today. Thank you, Wendy! I'm glad I was able to share a little of my story with all of you! Thank you for this opportunity! I wish you much continued success! I downloaded the extract of the first book to my kindle and I really want to read the rest! I'm addicted already!